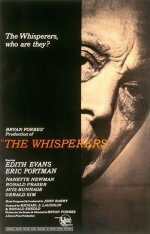 One of writer / director Bryan Forbes's most admired films, this is essentially an effective and moving study of loneliness, which has as its subject an old lady (the magnificent Edith Evans) teetering on the edge of senility. One does feel a little sidetracked by the plot development involving the poor old dear being exploited by her criminal son (Ronald Fraser) and husband (Eric Portman), but there is still the constant pleasure of Dame Edith at her finest, moving us to laughter and tears. Inevitably there is a small role for Forbes's wife Nanette Newman, and also for their daughter, Sarah Forbes, who plays Dame Edith as a girl. Downbeat drama starring Oscar-nominated Edith Evans as a lonely old woman who lives on handouts and is slowly drifting into senility. When she finds the proceeds of a robbery carried out by her wayward son hidden in her flat, she believes it to be a long-awaited cash inheritance. But her troubles begin when she shares the news with a scheming neighbour.